It has been raining almost solid for the previous two days which will basically make the trails way to slick her in Japan until early next week. When I say slick, I mean like butter on a tile floor slick. While my playtime this weekend is going to be off the trails, earlier this week I got out to one the “local” loops, Ogusuyama (aka Mt Ogusu). Like most of the riding I have done over here there is a bit of street riding involved to get there. I enjoy these street rides as I always see something culturally interesting. On this cruise to the trails while on one of the many tiny side streets, I passed by an onion stand that caught my eye. This stand was totally unattended and there was not even a window of a home within sight. It was totally on the honor system. There was not even a one-way coin box. Just pick out your onion and drop your 100 yen (About $1) in the box. If you need to, make change. I think this one little stand says a lot about the values and culture of rural Japan. The last little bit of pavement passes by a really thick and sizable patch of bamboo that always real cool to look into. The canopy is so thick that I have never seen direct sunlight on the ground here. Once on the trail, the light drizzle from the day before had left some slippery spots on the trail. I rode this area back in Decemember, but did not hit up all of the trails. I made a point to hit up the trails I had missed last time. Ogusuyama is the highest peak on the Muira Pennisula and the trail I took drops down to far side of the pennisula from Yokosuka. I have no idea what actual name of the trail I took is but most of my friends have just referred to it as Trail 3. This trail was really fun as it had great flow and cashed out the elevation in a way that allowed you to carry plenty of speed in most sections. This is one really cool trail marker. Once down the on the other side of the pennisula I did a bit of riding along the streets before picking a dirt access/fire road to head back up the mountain. While there were some steep pitches on the climb overall it was not brutal. I have certainly climbed plenty of uglier fireroads. Once back up on the top of the mountain, I decided to a take a path less traveled. While I noticed this faint trail heading off in the bush before, I had never ventured onto it. Today I gave it a shot as I had a decent idea of where it should go. I was riding solo in foriegn country on a lightly used and new to me trail. Throw in the fact I have an extremely rudimentry knowlege of the language at best and you should see why I felt so alive with healthy dose of excitement coupled with just a dash of anxiety. The trail ended up coming out pretty close to where I expected it and I enjoyed the stroll back to the apartment. It was another good day to ride a bike. I arrived in Japan last Saturday for a handfull of weeks worth of work in Yokosuka. The travel schedule to get here is a tough one as your internal clock is totally thrown out of wack. I spent most of the week just stuggling through the day and having a tough time sleeping at night. It took until Thursday for my “body clock” to get adjusted. Finally getting some rest was a good thing as I was looking forward to getting onto some single track this weekend. I shipped my 6.6 here vice putting it on the plane so I would not have lug the cumbersome box on the trains to get to Yokosuka from the Tokyo airport. My bike had not arrived on Friday so I rented a hardtail. One of my friends and his wife had just purchased a new home and invited me over to check it out. I declined on having them pick me up at my hotel. Instead I opted to have a nice cruise along the streets which I had nearly forgotten what a cultural experience you can have along the streets of a foreign country. I had a nice time visiting and catching up on things with my friends. Afterwards, I had a really cool late night cruise back to the hotel. The following morning it was time to get onto some dirt. I had not been on the trails between Zushi and Kamakura since 2004 and I was looking forward to it. It takes a quite a bit of riding along the streets from Yokosuka to get to the trailhead, but like last night riding along the streets is an experience all to it’s own. I had barely started on my way when there was a bunch of of activity going on over the roses at Verny Park. It had been a long enough since I was last here that there were spots where I was unsure if I was going the right way or not. Every time I would start to get concerned about my route I would see something that would jog my memory. I love riding when you are route finding or someplace new as your senses seem to elevate just a little. While this route was more about rediscovery, it was extremely fun just getting to the trailhead. Once I got to the trailhead, it was time to get some hike-a-bike on. Like many of the trails in this area, there are some steepness to be dealt with. The opening trail up onto the ridgelines was every bit as steep as I had remembered. I did not count them but I’m guessing there are at least 100 wood log steps that got the calves burning in no time flat. Once up onto the ridge the trails flowed and swooped gracefully through the trees. Most times there were fairly buff in nature but there were numerous section of roots and rocks to test your skills. I rode here many times in 2004 and this ride was like catching up with an old friend. I prefer to think that I have put some part of myself on these pages.Through words and images I have tried to share some of the things that touch me. When we were kids, there was a feeling that was so magical that it almost defined childhood. It is hard to describe, but it is a sparkly, exploratory sort of feeling. When we became adults, we left this feeling behind, only to experience it all too rarely and fleetingly. This feeling is called “a sense of wonder”. Try to have some of that each day. Here is one of my numerous “favorites” from his site which is totally unrelated to mountain biking. 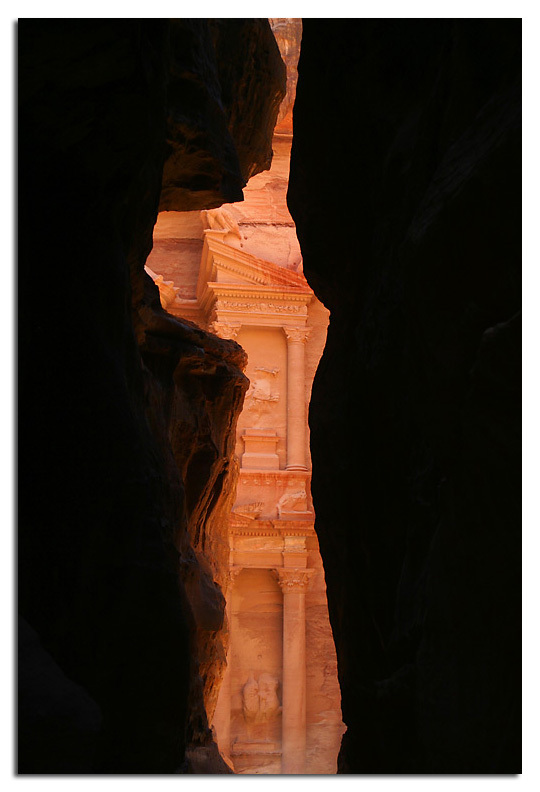 It is from the Khazneh in the ancient desert city of Petra in Jordon. I was there as well in 1996 and took a picture from nearly the same spot Anthony would take a picture from some years latter. Anthony’s version of the experience captured with his photo is a benchmark that I strive for. From the same spot with just a slightly different angle, some small detail that transforms mundane to extraordinary. His perspective and ability to see what “could be” from the same spot allowed him to convey that sense of wonder that mine missed. He did this with not only his photography but his words as well. The extraordinary is often right there if you know how to see it. Anthony’s imagery and words over the years has often left me and thousands of others in that “sense of wonder”. A truly great gift to all of us. If you have not had the pleasure of enjoying his work you can check out his website that will continue to be maintained by his family. Here is a short write up about him on MTBR and a link to some of his articles there. Here is one of the several active posts about him.